Sluka Still Supporting Tame Iti's "Freedom Fighters"
Massey University's Jeff Sluka researched the Irish Repubican Army, on the ground, in the slums of Belfast. Now he's supporting our own "freedom fighters"-those arrested by New Zealand's "terrorist" police force in the October 15th 2007 anti-terrorism raids. Political Anthropologist, Associate Professor Jeff Sluka, is coming to Wellington. 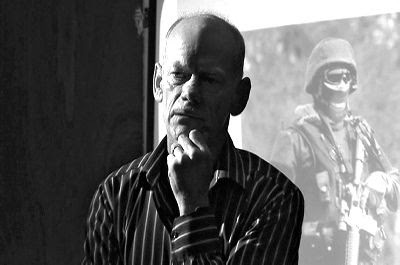 On Tuesday 2nd December Jeff Sluka will be the key speaker at public meeting discussing State terrorism during the 2007 ‘anti-terrorism’ raids in Rūātoki. This is the fifth in a series of meetings hosted by the October 15th Solidarity Group group. Jeff Sluka is an anthropologist whose particular interest is armed national liberation movements – that is, ‘freedom fighters’ – and he’s one of the few social scientists who has actually done first-hand research with people defined as ‘terrorists’ in their natural settings. “Jeff challenges people to think about the labels of terrorism and terrorist,” said Anna. As a result of the raids last year there are now 18 people facing charges. Attempts by the police to lay charges under the TSA failed but people are still facing politically motivated charges under the Arms Act. And a new charge of participating in an organised criminal group has been laid against five of the 18. New Zeal Interesting to see Anna Thorby popping back up. She's a "freedom fighter" too. In the 1980's Anna Maree Thorby was involved with Sue Bradford's Auckland Unemployed Workers Rights Centre-a Workers Communist League/anarchist run outfit. In May 1986 Thorby and her accomplice Debbie Leyland were convicted of common assault and disorderly behaviour and jailed for 6 months for throwing eggs at the Queen, during HRH's visit to Auckland. In 1990 Thorby was arrested for trespassing in the Auckland Treasury building with several other protestors including Sue Bradford. What is New Zealand doing financing courses in "political anthropology" when the country is heading for a financial bust? Massey was once one of the great agricultural universities of the world, and that's a far more useful and prestigious field to be in than "political anthropology". Hmm it seems the above commentator has a Stalinist mentality. "Don't study silly things like politics, study things that can make the USSR great!" Anti-American too. Yankee go home! I have met Sluka a couple of times and found him engaging and likable. But the dice have been cast. I believe Massey now offer a course in Witchcraft. No books required, bring your own buckets of offal. "What is New Zealand doing financing courses in "political anthropology" when the country is heading for a financial bust? "Anti-American too. Yankee go home!" I can only assume that you draw your oversimplified conclusion from Dr Sluka's stance on human rights. Which is something I find most disheartening. I'm one of his students. He should not go home. He should be listened to. Open your ears and open your mind. It doesn't have to be so black and white.